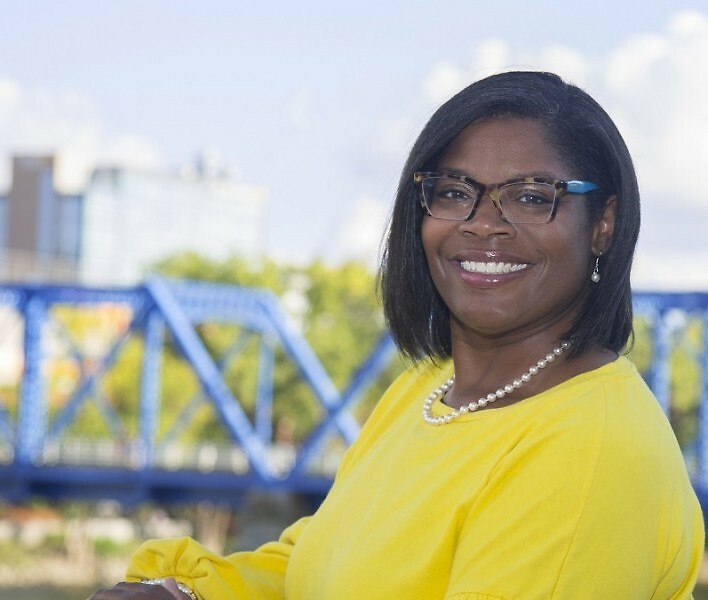 This self-described church girl from Missouri whose family relocated to Grand Rapids during her middle school years speaks directly and passionately when describing her love for the community and the community’s children. This year seven candidates square off for five open seats on the Grand Rapids School board November 6, 2018 election. Of the seven candidates, three are incumbents (Tony Baker, Jose Flores, John Matias) and four are new challengers (Kimberely Williams, Kymberlie Davis, Chad Patton, Michael Bukala). I had the opportunity to sit down with Mrs. Kimberely Williams recently and discuss her decision to run for one of the open seats. What made you decide to run for GRPS School Board? I am concerned about GRPS students. My husband Vic and I have been advocating for children for years. We have assisted families in advocacy for their children in the school system as well as the criminal justice system. Over the years, several people have asked me to run for GRPS School Board, my focus, however; was raising my children. Now that my children are in college and doing well I figured it was a good time to throw my hat in the ring. Is there any issue with the school system that you believe needs special attention? My main focus is creating a culture of academic excellence. We should hold both students and teachers accountable. We must continue to hire quality teachers that are committed to the children and quality curriculum. In addition, as a criminal justice professional I am naturally concerned with the school-to-prison pipeline. Approximately 75% of GRPS students are Black or Latino. According to a report by The Hamilton project, “there is nearly a 70% chance that an African-American man without his high school diploma will be imprisoned by his mid-thirties.” We must be intentional about putting our energy into academic excellence. If we are not intentional about the success of our students then we are intentional about the failure of our student. There is no middle ground. What if anything can be done to stop the school closures? With regard to school closures, so many other factors come into play. We have had issues with housing. People are leaving the community. We need to bring excitement about our district back. We need to build a culture around our district. Back when there was a city league there was a level of city pride. Whether you attended Ottawa, Creston, Central or Union there was a level of pride in our district. We don’t seem to have that pride anymore. We need to take effort and figure out what we need to do to instill that community pride again. When we have the community pride, we will get the students back in the district. How does your faith affect how you would carry-out your role as an elected official? I was raised in Bethel Pentecostal Church, under the leadership of Bishop Abney. Our church slogan was, “The church in the heart of the city, with the city in its heart.” Bishop Abney lived that, he was very passionate about the community. My passion for our children, integrity and standards that I set for myself are in large part, a result of this church experience from middle school to adulthood. As a result, I will not join the school board to be a rubber stamp. My convictions won’t allow it. I will stay true to my faith and my mission which is to join the school board with the community and the children at the forefront of my thinking at all times. Do you see any connectivity between your day job as a Civil Rights Investigator with the MDCR (Michigan Department of Civil Rights) and the set you seek to fill on the GRPS Board of Education? I’m always looking for equity and fairness. I do not like to see people disenfranchised. I’ve been this way my whole life, long before accepting the position at MDCR. That passion for equity and fairness will certainly continue to exist in this new capacity as a GRPS Board member. I want people to be treated fairly. I will fight to make sure both students and employees are not experiencing illegal discrimination. You recently traveled to Paris and Egypt with your husband. How has that experience affected how you would approach your position as a GRPS Board member? International travel broadens your view. We were exposed to things that we would not have been exposed to had we not engaged in this travel experience. I think the connectivity here is, I have gained a greater desire to look broader for solutions to problems that affect our school system. What could we do differently? What successes have school systems experienced in other countries that we could duplicate here? There are school systems in other countries, other states and other cities that are doing some things differently and having success. We have to be open to broadening our perspective when it comes to creative solutions to the problems faced in GRPS. Our theme schools are a good example of out of the box thinking. Nevertheless, we have to make sure we are also taking care of our neighborhood schools. We need to make sure the same quality of education is available to our students in those schools as well.